The 1970 Belgian Grand Prix was a Formula One motor race held at Spa-Francorchamps on June 7, 1970. It was race 4 of 13 in both the 1970 World Championship of Drivers and the 1970 International Cup for Formula One Manufacturers. March driver Chris Amon set the new lap record at this race, at a speed of 152 miles an hour. Race winner Pedro Rodríguez had set a 160 miles an hour lap in a sports car race the week before the Grand Prix. It was also Rodriguez's last victory in Formula One, and BRM's first victory since Jackie Stewart won the 1966 Monaco Grand Prix. This was the second Formula One win ever for a Mexican driver, and as of the conclusion of the 2018 Formula One season, the most recent. 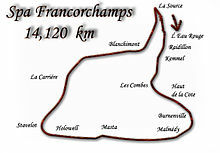 This was the last Formula One race to be held on the original Spa circuit. It was also the last Formula One victory for Dunlop. ^ "1970 Belgian Grand Prix". formula1.com. Archived from the original on 31 October 2013. Retrieved 22 December 2015. ^ a b "Belgium 1970 - Championship • STATS F1". www.statsf1.com. Retrieved 12 March 2019. This page was last edited on 12 March 2019, at 14:25 (UTC).